In 2004 and 2007, the European Union (EU) completed its Eastern enlargement, the largest intake of new member states in its history. EU accession also constituted a watershed in the history of Central and Eastern Europe (CEE). In the course of enlargement, these countries have undergone pervasive “Europeanization” – a process of EU-driven change of their political and economic systems. Contributions to this special issue focus on the major questions for this collection: How has the Europeanization of CEE changed after accession, and how has it played out in the politics and the economies of the region? In this introductory paper, we provide a conceptual and theoretical framework for these contributions and give an overview of their findings. The conceptual and theoretical section introduces the concept of Europeanization and reflects on the changing nature of Europeanization after Eastern enlargement. 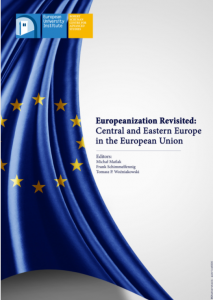 We argue that the conceptual conflation of Europeanization as process and outcome, which was defensible in the CEE accession period, needs to be reconsidered. After the 2005 enlargement, domestic factors and alternative international influences have gained in importance vis-à-vis EU-driven policy change. Consequently, gaps between Europeanization as policy diffusion and Europeanization as actual policy convergence are likely to increase and need to be theorized. Moreover, the theorization of mechanisms of Europeanization needs to be moved beyond the original focus on conditionality – and top-down, direct mechanisms more generally. After the accession period, and in the areas of political and economic Europeanization, indirect, horizontal and bottom-up mechanisms of Europeanization have gained in relevance.